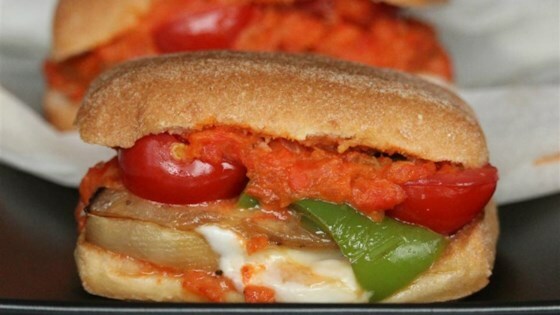 "A healthier vegetarian sandwich great at lunch or after work or school." Grill red bell pepper slices in the panini press on high heat until soft, about 5 minutes. Transfer to a blender. Place chopped tomato and garlic in the blender. Blend with bell pepper until a smooth sauce forms, about 2 minutes. Season sauce with oregano, salt, and black pepper. Grill eggplant, zucchini, tomato, and onion slices in the panini press until softened, about 3 minutes per side. Drizzle olive oil over bread slices; flip and spread with a generous amount of sauce. Place 2 slices bread, oil-side down, on the panini press; add 1 slice of mozzarella cheese. Top with eggplant mixture and second slice of mozzarella cheese. Place second slice of bread, oil-side up, on top. Grill on medium-high until golden and cheese is melted, about 5 minutes. Colorful vegetables bake in a garlicky tomato sauce. Very tasty! I just used crusty french boule, instead of sourdough. Used fire roasted(by accident) crushed tomatoes in sauce and it gave it a nice kick. Tasty. Pretty much did as the recipe dictates. I will make it again. Messy but delicious! Leftovers make a great salsa for pasta. Thank you for the recipe.